What word expresses an action, state, or occurrence, and forms the main part of the predicate of a sentence? It’s a verb and it’s about to change the way you market your products on Facebook. Facebook’s annual f8 developer conference included the announcement of what Facebook calls the Open Graph. The Open Graph allows third-party developers to create expressive buttons, very similar to the famous “Like Button”, and place these interactive buttons on your product description pages. For example, in the very near future you may see Facebook buttons with the following verbs on some of your favorite websites: want, buy, own, listen to, read, eat, watch and work out. You may be wondering what happens once a customer clicks one of these new action buttons? Facebook plans for these actions to appear in the newly released “Ticker” portion of your Facebook page. This is the area of Facebook where you may serendipitously discover what your friends are doing while you’re browsing Facebook. The eCommerce platform Magento is the first eCommerce company to offer integration for the “Want” and “Own” buttons with Facebook’s new Open Graph. These new, more expressive actions may prove to be a great tool for generating more traffic from Facebook to your product pages. 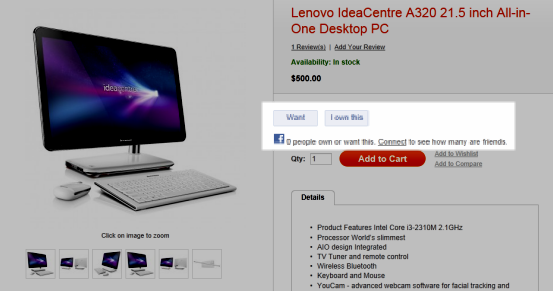 eCommerce companies should now begin testing these buttons on select products to determine their interaction rates.